Don't slice the bottle and bomb. Slice special fishes for powerful effect. 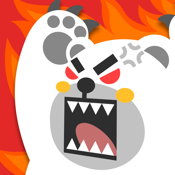 Dodge and Defend Boss Bear's offense and attack his head via swipe.